PathCrosser has snagged what looks to be a great party at this year’s SXSW, which includes the likes of The Roots’ Questlove. 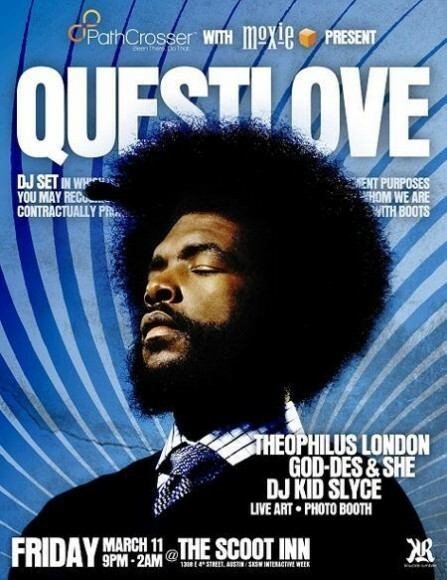 On Friday March 11 at The Scoot Inn, Pathcrosser will host Questlove, Theophilus London, God-Des & She, and DJ Kid Slyce. Attendees who download the PathCrosser app beforehand can get a complimentary drink at the bar. And the first 250 people to share on Twitter Moxie’s first quarter location based services trends report, which will be revealed at the party, also get a free drink. Check out the poster above for full info!